Ammon Ranch - 701-465-0207 Website: www.ammonranch.com. Email: ammonranch@yahoo.com. Home of Holidocs Husker, American Quarter Horses, Beef Cattle and Feed. Family owned and operated ranch in central North Dakota. Anamoose Cafe & Bakery - 701-465-3236 - Located on Main St. Open Tuesday-Friday 7am-2pm, Saturday 7am-1pm. Bakery items include: white & wheat bread & buns, rolls, German kuchen, & cookies baked fresh daily. Breakfast and dinner served daily. Anamoose Post Office - 701-465-3916 Open Monday - Friday 8am-12 noon, Saturday 8am-10am. Packaging and gift items available. 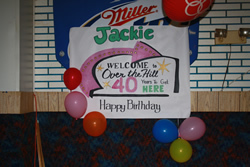 Barbie's Banners - 701-465-3256 Owner Barbie Martin. Banners for any occasion- weddings, graduation, family reunions, birthday, etc. 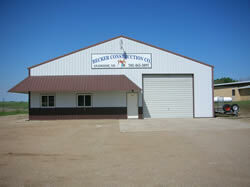 Becker Chopping - 701-693-6039 Custom corn chopping. 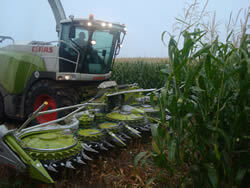 Twelve row corn chopper and truck. Owned by Chris and LeRoy Becker. 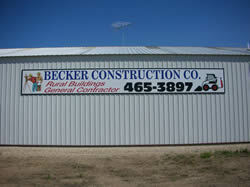 Becker Construction - 701-465-3897 Monday - Saturday 8am-5pm. General Contractor, Licensed and Bonded. License No 2870 Class C State of ND. Residential, commercial, and agricultural work. Carpentry and concrete work including: concrete floors and footing, sidewalks and driveways, garage and homes, windows, siding and roofing. Metal covered buildings. Pole buildings and wood framed buildings. Roofing replacement-sheetmetal and shingles. New work, and remodel work. Estimates provided. Bjorland Trucking - 701-465-3430 or cell 701-693-6526 Rick Bjorland, truck owner, operator. Hopper bottom grain hauling & flatbed hauling. Regional & tri-state area hauling. Buechler Oil - 701-465-2462 24 hour/7days a week cardtroll. Central Dakota Electrical Consulting - 701-465-3685 (office) or 701-465-0222, e-mail: cdec@direcway.com Electrical design for commercial buildings. Call Robert Granlund for appointment. Countess Farms - 701-465-3095, e-mail: countessfarms@outlook.com, website: www.countessfarms.com, Facebook: Countess Farms. We offer cow shares and goat shares to the public allowing the shareholder to own a share of the herd entitling the shareholder to milk each week from the herd. We also offer pastured beef, pork, goat and lamb. Dosch's Taxidermy - 701-465-3026 Fish, birds, & game heads. Ewert Construction - 701-465-7208 Residential & light commercial construction. Remodeling & new construction. Custom cabinets. Farmer’s Union-Anamoose - 701-465-3280 Seed treatment, chemical and seed sales, field scouting and custom mapping. First State Bank Anamoose Branch - 701-465-3285 Monday-Friday 9am-3pm. Full service bank with: Business & personal checking (with check & deposit images returned) savings accounts, N.O.W. & Super N.O.W. Accts., Dakota Senior Club Membership for customers over 50 with many excellent benefits, traditional or Roth IRA's, direct deposits of social security & other payments, electronic funds transfers, Certificates of Deposit & US Savings Bonds, investments, loan services available, money orders, cashiers check, wire transfers, travelers checks, VISA credit cards & debit cards with no annual fees, safe deposit boxes, photocopies, fax transmittals, & notary services, bank by mail, after hour depository, & 24 hour tele-banking. 24 hour ATM services & cards available at Harvey. First State Bank Insurance Agency - 701-465-3613, Monday-Friday 9 AM-12 Noon and 1 PM-3 PM. Insurance Services in the following areas: Auto Insurance-personal or commercial, Crop Insurance-hail insurance multi-peril crop insurance, Annuities-traditional IRA’s, Roth IRA’s & other non-participating plans, Term Life & Health insurance available through referrals with Blue Cross/Shield or other health insurance providers. Harvey Farmers Elevator- Anamoose 701-465-3203 Monday - Friday 8am - 5pm. Handle all grains. Sell fertilizer and chemicals. Custom applications. Seed sales. Helland Harvesting - 701-465-3597 or cell: 701-693-6092 Custom Combining. Two John Deere combines with semitrailer and supporting equipment. Family operation. Start on Oklahoma-Texas border and work up through ND to Canadian border. Call for your harvest needs. Heringer Lumber - 701-465-3333 Monday - Friday 8am to 5:30 pm, Saturday 8am to 12 noon. Email: heringerlumber@gondtc.com. Full service lumber and building materials including: hardware & paint, shingles, siding, windows, garage doors, estimates, floor covering, & keys copied. KB's Bar - 701-465-3807 Monday - Saturday 10 am to 1 am, Sunday 1pm to 9 pm. Happy Hour Monday-Friday 5:30 to 6:30. Serve pizza, sandwiches & appetizers. Game room and food area for those under 21. Main Auto - 701-465-0201 Monday -Friday 8am to 5 pm Automobile & small truck repair. Midwest Graphics & Signs - 701-693-2300 (office) or 701-693-5454 (cell) Website: www.midwestgraphicsandsigns.com. Offering signs, window lettering, digital printing, truck lettering, banners, and vehicle accessories. M.R. Drywall - Mark Engen 701-465-0216 Interior taping, texturing, and painting. Pete's Tractor Salvage - 701-465-3274 or 1 800 541-7383 website: www.petestractor.com. Monday-Friday 8am to 5:30 pm Saturday 8am to 12 noon. Used farm machinery parts. R & R Creations - 701-465-3612 1850 36th St NE, Anamoose. Homemade diamond willow end tables, coffee tables, & plant stands. Will make other items to your measurements such as TV stands, entertainment centers, benches, kid's table and chair sets, etc. Also uses beetle kill ponderosa pine and other woods from the Anamoose area. Sage Hill Bed and Breakfast - 701-465-0225 www.sagehillnd.com Be pleasantly surprised with the warmth of a unique 1929 rural consolidated schoolhouse located in the prairie pothole region of central ND. Excellent opportunity for bird viewing or water foul hunting. Three guest rooms-each with private bath, TV, and coffee. Full country breakfast, relax in the library, or cuddle up to a warm cozy fire. Experience award winning gourmet dining (by reservation only). Reception area for meetings, weddings, or special events. Open year long. Smoke free environment. Well mannered pets welcome. Accept major credit cards. Schmaltz's Greenhouse - 701-465-3765 Spring time-bedding plants, vegetables, hanging baskets, terracotta planters, bulk seeds, fertilizers, potting soil. Southern Suds - 701-465-3095, e-mail: countessfarms@outlook.com, website: www.countessfarms.com, Facebook: Countess Farms. We make handcrafted soaps, lotions, body butter, scrubs, and mre. Gift baskets are available. SpearPoint Arms - 701-465-3079 or 701-693-5280 (cell), e-mail: SpearPointArms@gondtc.com. Scott and Rachel Spear. We can buy and sell firearms and accessories. We have our Federal Firearms License. Hours are 9:00am - 11:00am M-F, but please call anytime for after hours appointments. We can order any gun to meet your needs! Tanamt.com - Tana Walker (866) 215-9165 Did you know there are five areas of Identity Theft and nearly 40 million Americans personal data has been exposed by data breeches of businesses, government offices and schools? VFW Club - Available for receptions, meetings, and large group activities. Capacity approximately 250. Call Duaine Docktor to rent: 701-465-3692. Walker Enterprises - Steve Walker 701-681-1800 Pole building construction. Weninger Quarter Horses - Lori Weninger 701-465-3808 Web site: www.weningerquarterhorses.com 1412 35th St. NE, Anamoose. Registered quarter horses bred & sold.